The practical importance of auction theory is widely recognized. Indeed, economists have been recognized for their contribution to the design of several auction-like mechanisms, such as the U.
S. Federal Communications Commission spectrum auctions, the 3G auctions in Europe and beyond, and the auction markets for electricity markets around the world. Moreover, auction theory is now seen as an important component of an economist's training. For example, some of the more celebrated results from the single-object auction theory are now usually taught in advanced undergraduate and first-year graduate courses on the economics of information. The techniques and insights gained from the study of auction theory provide a useful starting point for those who want to venture into the economics of information, mechanism design, and regulatoryeconomics. 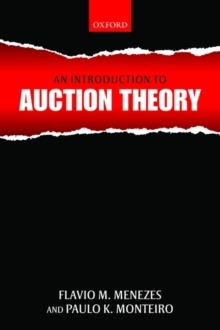 This book provides a step-by-step, self-contained treatment of the theory of auctions. The aim is to provide an introductory textbook that will allow students and readers with a calculus background to work through all the basic results. Coverage includes: the basic independent-private-model; the effects of introducing correlation in valuations on equilibrium behaviour and the seller's expected revenue; mechanism design; and the theory of multi-object auctions. The paperback edition of the textincludes a new chapter which acts as a guide to current developments in auction theory.